Hello, All! 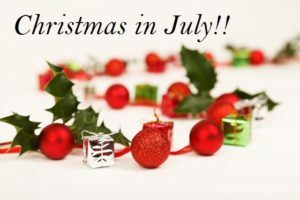 It’s another Christmas in July giveaway. I don’t know about you, but I love reading Christmas stories all year round. However, it’s a little harder to write a Christmas romance when it’s 90 degrees outside :) So, while during the time I was writing A Match Made for Christmas, (which is my novella that is included in this boxed set, A Christmas Potpourri – Vol. 2.) I had to find a way to help me get into the Christmas spirit. A Christmas story for every taste from clean to Christian, from short to full length, from historical to contemporary, you’re bound to find a story to suit your taste. Come celebrate the season with us and have your heart touched by romance. There’s a scene in A Match Made for Christmas where they shared their first kiss under the Mistletoe. Question… Have you ever been kissed under the Mistletoe? Looks like a fun Christmas read by talented authors. Been watching Hallmark Christmas movies this month to stay cool. It has been a hot humid month with temperatures in the 90s and 50% humidity. Even though German American, as a world language teacher, I embrace other countries traditions and cultures. So when I married my English French husband for several Christmases I did hang mistletoe. After all there is a Pennington castle in England and to embrace the British customs, so YES I ha even kissed under the mistletoe. I also love reading Christmas stories all year around (I’m pretty sure I’ve read A Match Made for Christmas several months after December– and I really liked it). Hanging mistletoe is not a tradition in my family and I’ve never been kissed under it. I don’ really think I’m missing anything as I’ve come to think situations like that are not really natural and might embarrass a lot of people like in Believe in Me by Autumn Macarthur. Good morning, Priscila! Yes, A Match Made for Christmas was in another boxed set last year, too. :) and I’m so glad you liked it. I always hang mistletoe at my house every year, BUT the only man I kiss under it is my husband. I avoid it, at all cost, anywhere else I go. LOL! My husband loves to catch me under the mistletoe! The kids, all adults now, love to put it up. Your collection sounds exciting. I can imagine writing it in summer would be challenging. That’s cute. My daughter kept trying to get her fiance under it! They were married July 16 and are enjoying married life. I have not been kissed under the mistletoe. I don’t think we have ever decorated with it. I love Christmas stories. Good morning, Beth! Oh, I decorate with it every year, it wouldn’t be Christmas around my house without it :) Like I said in one of my earlier comments, we use the real stuff, too, not the store bought kind. Good morning, Mimionlife! You and I both could share your comment. The only thing I would have to change to make it my own would be, my husband and I have been married 35 years, instead of 37 :) Keep kissing under the mistletoe! Good morning, Michele! Your comment made me laugh. I wouldn’t object to a mistletoe kiss either, as long as it’s by someone I love, such as my husband, children, and grandchildren. No strangers, please. LOL!!! Good morning, Margaret! I like the idea of selling Mistletoe around the neighborhood, my grands may love to do that this year :) Thanks for sharing that with me! Been kissed under mistletoe. We will be celebrating our 30th anniversary in December. The set of stories sounds wonderful; will definitely want to read them. I’ve never been kissed under mistletoe, but I have been kissed under holly that my kids mistook for mistletoe. Hey Melynda! How cute! A Christmas kiss is a Christmas kiss, rather it’s under the mistletoe or holly :) What makes it so special is who the kiss is from. It’s been hovering in the mid 90’s here in SC, and my husband and I pick this month of all times to move! Not fun packing and moving boxes in this heat. Hello, Patty! As we say in the south, bless your heart! This has been a really rough summer, I can’t imagine having to pack and move boxes in this kind of heat…Whew!!! This sounds like a great book. I love Christmas stories. I have been kissed under the mistletoe by my husband several times. Thanks, Susanmsj! I hope everyone will enjoy this boxed set. It will be a wonderful addition to add to anyone’s collection. To be kiss by the love of life under the mistletoe is the best Christmas kiss of all! I like the IDEA of being kissed under a mistletoe that I wrote a book about it (the first kiss by a man who said he wouldn’t kiss a woman unless he knew she was the one he’d marry). It was based on my own husband’s personal vow (but not necessarily under a mistletoe). :) Blessings, Debra, and wishing you well with your new box set. Christmas books are fun at any time of the year. Thanks, JoAnn! Your book sounds like a great story. What’s the title? I’d love to add it to my Christmas reading list :) and I’m sure others here will, too. It’s terrible that I can’t remember if I was kissed under the mistletoe, but I’m guessing I was. When we lived in Oklahoma for a couple of years, we had a big tree in our front yard that had a lot of mistletoe growing in it. I remember someone (maybe from a florist?) stopping by and asking if they could have some. I never knew mistletoe grew in trees. Oh I love Christmas stories. Yes, I have been kissed under a mistletoe. I didn’t even know it was hanging above my head until my best friend (male) kissed me. It was a sweet kiss and we both laughed since there was absolutely nothing romantic about our relationship. I think I got gypped. I’ve never been kissed under a mistletoe. Maybe that would change if I hung some in my house this Christmas. Hmmmm, why wait until Christmas, right? tee hee So excited to be in the fabulous collection with my friend, Debra and many of the other authors whose work I admire. Hello, Debra! I may just have to mail you some mistletoe this Christmas, and then you can tell Rick to pucker up :) I am super excited to be in this collection with you, too, my dear friend! I know I have by my husband :-) I have a Christmas ornament that’s a clear plastic ball with mistletoe in it that we hang in the hallway every year. Since our bedrooms and bathroom is down the hall, well, you gotta stop and get a kiss…lol! I have a really hard time getting in the Christmas mood in July, but maybe this collection might help! Sounds like a great set of authors. Thanks for the chance, Debra! I don’t remember if I have been kissed under the mistletoe, but I love reading Christmas stories. I’ve never been kissed under the mistletoe but I know what hot Christmas days are like as I live in Australia. Luckily I have a good imagination and reading about snow and coats and hats at Christmas is okay. If I wrote about a Christmas Day and sweltering heat you some of you gals would struggle. My Grandmas often cooked roast turkey with trimmings in the heat. My Mum remembers cooking this meal in a fibro house with an agar style stove/oven as it was the only from of cooking since we lived off the grid and used a diesel generator and batteries for power. The photos of us are all in shorts and t shirts looking very red, hot and sweaty! I don’t need mistletoe for my husband to kiss me, lol! I love reading Christmas stories anytime of the year. In summer it sometimes psychs me into believing it’s cool when we have 100 degree weather. It’s hot here in KC also! 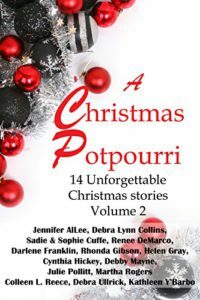 A Christmas Potpourri has wonderful authors contributing to it! I love Christmas in July! I am just now reading Elizabeth Maddrey’s Operation Mistletoe. I like the Christmases where we have snow instead of ice! I love everything about Christmas! But my son-in-law from California won’t even go outside when he visits!!! Hello, Lelandandbecky! Yes, I agree with you about the ice. If we are lucky enough to even get snow here in Alabama, I’d much rather have snow than ice any day. I absolutely love everything about Christmas, too. :) I love it so much so that every year the day after Thanksgiving, my tree and all the decorations goes up. I plan early. lol! It sounds romantic to be kissed under mistletoe, but I never have! !